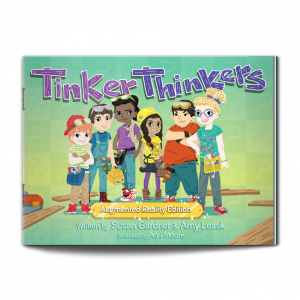 Meet the Tinker Thinkers! Equipped with the tools of logic and reason, this team of pint-sized ponderers build their way to better ideas. Join them as they explore the parts of an argument, and learn new ways to test its strength. You’ll find that building an argument is one of the most important skills a person can learn…and it can be fun too! Ages 7-10. Explore the augmented reality edition of Tinker Thinkers using your iOS or Android device, and watch the team leap off the page! Purchase the book, follow the download instructions for a free app, and your little thinker is on their way to a more engaging reading experience. Learning to argue has never been this cool!